Thorntons shares rose more than 42% after Italian chocolate maker Ferrero International made a bid for the firm. The cash offer of 145p per share valued Thorntons at around £112m, and represented a premium of around 43% on the closing price on Friday. Thorntons saw sales and profits fall in the half year to 10 January, and issued a profit warning in December. Ferrero is known for Nutella spread, Ferrero Rocher chocolates, Kinder Eggs and Tic Tac sweets. 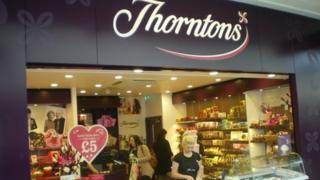 Thorntons has urged shareholders to back the offer. Chairman Paul Wilkinson said: "Ferrero is a successful global confectionery business with a strong family heritage and as such represents a good cultural fit for Thorntons. Ferrero chief executive Giovanni Ferrero said: "We delivered our best ever results in the UK in 2014, giving us confidence that now is the right time to broaden our roots in this important market." In March, Thorntons said its half-year profits were "disappointing" after pre-tax profit fell 8.8% to £6.5m, with sales down 8.2% to £128.2m in the 28 weeks to 10 January. It said it was hit by a drop in orders by two major supermarkets and supply problems at its new centralised Derbyshire warehouse. The firm issued a profit warning in December due to poor sales of its products in some supermarkets. Thorntons was established by Joseph William Thornton in Sheffield in 1911, and has 242 of its own shops and cafes in the UK and Ireland, It also has 158 franchise outlets. It employs around 3,500 staff, and about 3% of its revenues are generated overseas. Family chocolate firm Ferrero posted sales of €8.4bn in the year to the end of last August, and employs around 27,000 staff. Billionaire Michele Ferrero, whose chocolate empire made him Italy's richest man, died aged 89 in February.